What to do with all this zucchini? So I have another delicious way to use all that zucchini you have in your garden…..zucchini cakes (kinda like crab cakes). Oh so yummy. I took some day old garlic/jack bread from a local bakery (so good- big pieces of roasted garlic baked inside the bread) and I dried it out in the oven then threw it in the food processor to make bread crumbs. Grate/shred the zucchini add a couple eggs (depending on how much zucchini you use will determine the amount of eggs) and the breadcrumbs, and more cheese (if you like cheesy goodness) and salt and pepper to taste. One batch I sliced onion and added to the mixture (you can pretty much add whatever else you like -maybe chopped red peppers). Mix it up then make into patties and put in pan with hot oil (you don’t need a lot) cook until golden brown on each side (I sometimes like them a little more than golden). So yummy. Sorry no picture to go along with this entry- but try it- I can guarantee you’ll like it. I know I will be sad in the middle of winter when I don’t have a zucchini plant to go pick from – but man, one little plant sure provided us with a good amount of zucchini (and the neighbors too). I sliced and shredded some and put it in the freezer- it’s a bit of an experiment. I figured the shredded can be used later for these cakes, or cookies, or bread (won’t matter if it’s a bit mushy) and the sliced I’m hoping will hold their shape and consistency so I can use it for fritattas or stir fry. We’ll see – I’ll let you know how the experiment turns out. 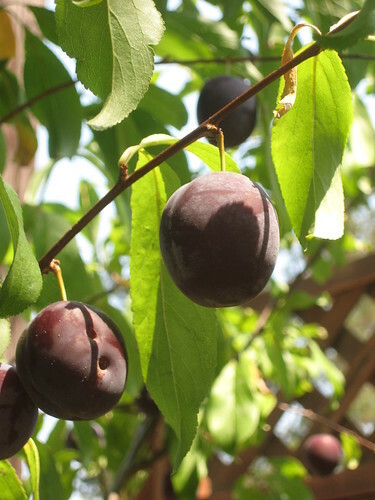 We have been enjoying our Santa Rosa plums this year. Last year we had some but this year is better. So far they have been the perfect size to just pop in your mouth (well maybe my mouth- which is bigger than average) and eat down to the pit (without getting a finger dirty). The kids have been enjoying the as well. 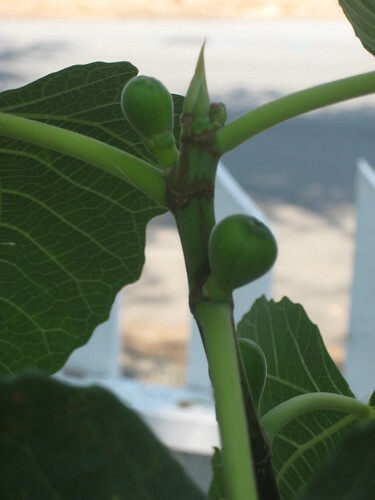 The fig tree has about 15 little figs popping out. Not much- but I’m stoked just to have those- Doug isn’t a huge fig fan so these are mainly my little goodies. The zucchini is still flourishing. I have to check daily b/c if I don’t I end up with those giant suckers. Which is fine- they work good for making zucchini choc. chip cookies. Ryder and I made a huge batch the other day (we tripled the recipe) so we could bring some to his school and Doug’s work and for the neighbors. 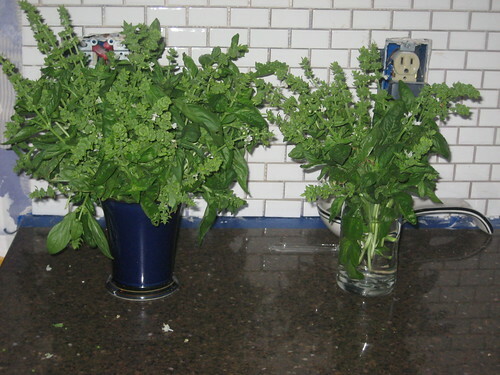 We harvested some basil- it was about to flower- so we made some yummy pesto. Not sure what’s happening with the cauliflower- I may have to just pull it and call it a loss- the plants are huge but there is no head forming? I keep saying I’m going to pull it- but then I give it another chance. If I don’t see any sign of a head I’m pulling it next week and putting in carrots. We are on our second batch of lettuce- oh how I love fresh picked lettuce for our salads. Right now my kick is fig and Gorgonzola salads with homemade balsamic vinaigrette- I can eat that for every meal. A happy surprise to find in the garden were 2 rogue tomatillo plants that popped up (obviously from last years crop). I love tomatillo salsa. And everyday I check my tomato plants thinking there will be a miracle and I’ll wake to find all the plants with ripened tomatoes (even though the day before there were none even remotely ready!) I can dream can’t I. I keep reminding myself before I know it I’ll be up to my eyeballs in tomatoes and overwhelmed! The strawberries keep coming too, not in gross numbers- just a nice steady pace. So that’s the skinny on the garden right now. Well, the weather finally cooled off a bit so I was able to turn on the oven yesterday and Ryder and I got busy baking. 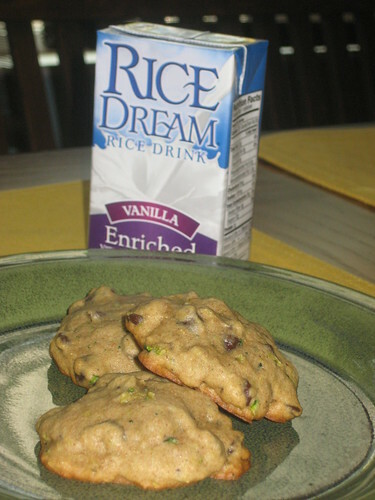 I tried out the recipe for zucchini chocolate chip cookies from AVMand they are awesome! The whole fam loves them. I even brought some to my co-workers to try and they too liked them. For those of you who have tons of zucchini this is a great way to use them up- and who can ever get tired of chocolate chip cookies!? I was in the baking mood yesterday (which isn’t normal b/c I like to cook more- you know a little bit of this, a little bit of that. I’m not into measuring). 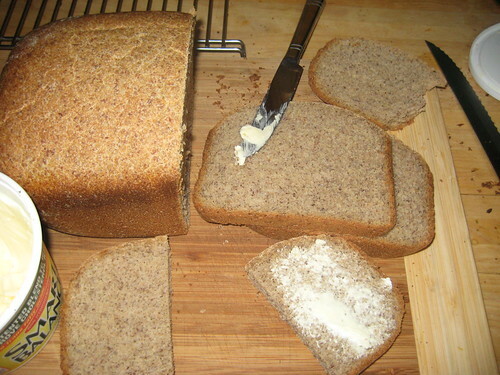 But I have been wanting to try this recipe for Honey wheat flax seed and sunflower seed bread (minus the sunflower seeds b/c I didn’t have any). Well it was fabulous! I recently dusted off my bread machine – which was sitting on the pantry floor for the last 5 years, if not more, and have been loving it. Ryder and I love to make bread now. It’s so easy, the house smells great when there is fresh bread baking. And say what you want about the bread machines, but I think it’s wonderful, you can have fresh bread all the time. I know it’s not quite the same as getting your hands in there and kneading the bread yourself- but when you have 2 kids, a job, lots of hobbies, etc, this makes it easy to have fresh, healthy bread with no preservatives. And talk about cheap. A loaf of bread costs you pennies when you break it all down. So go dig out the bread maker that you haven’t touched for years, dust it off and watch how excited everyone is when there is a fresh loaf of bread baking. I use it too for pizza dough (which I must say is the best pizza dough recipe- thanks Kendra. It’s also great for kids – it’s easy and fun for them to watch – Ryder loves to check the status of the bread. Here are a couple of my faves I’ve found, hope you and your family enjoy them too. set on dough cycle. Makes 4 thin crust medium pizzas. Bake @ 500 degree F. for 10 – 15 minutes. if you want thicker crust let rise for 30 minutes after rolling out dough. 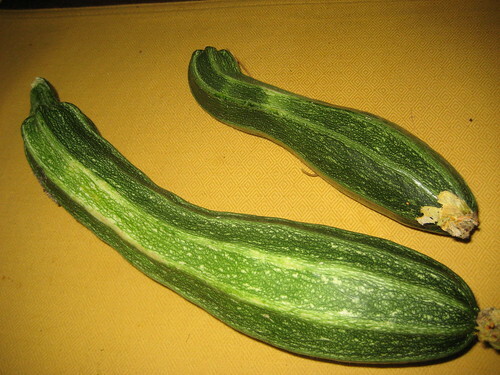 To my surprise I found two zucchinis in my garden yesterday. 2 years ago I planted a couple zucchini plants and had it coming out of “you know where”. I couldn’t give it away- because everyone else was trying to give theirs away too. And I think I had done all the zucchini dishes I could think of a couple times and I think Doug was pretty over the zucchini dishes. So anyways, after that Summer I said, no more zucchini, I’ll just buy it at the farmer’s market or get it from friends that grow it and save that space in the garden for something else. Well my friend Kendra (http://asonomagarden.wordpress.com) and her husband gave us a couple different plants that they had started and to my surprise one of them was a zucchini apparently. I forgot that they had given us that plant, I was so happy – thank you Kendra and Scott! So I was so excited because I remembered there were a couple yummy sounding recipes from Animal, Vegetable Miracle so I went to my (what I refer to now as my bible) book and found the recipe for Disappearing Zucchini Orzo. Soooo loving that recipe! Thanks Camile! If this heat ever lets up I’m going to try the zucchini chocolate chip cookies – I’ll let you know how those turn out.